This is actually the first and only post I've had this week. I know, terrible, right? But trust me, it was in no way due to slacking. I've just been super consumed by my real job and have been so über exhausted that there was no time for photo shoots, photo editing or writing posts. So, in an attempt to make amends with myself (and you all, of course), I tried to make this one a multi tasking Style File post. 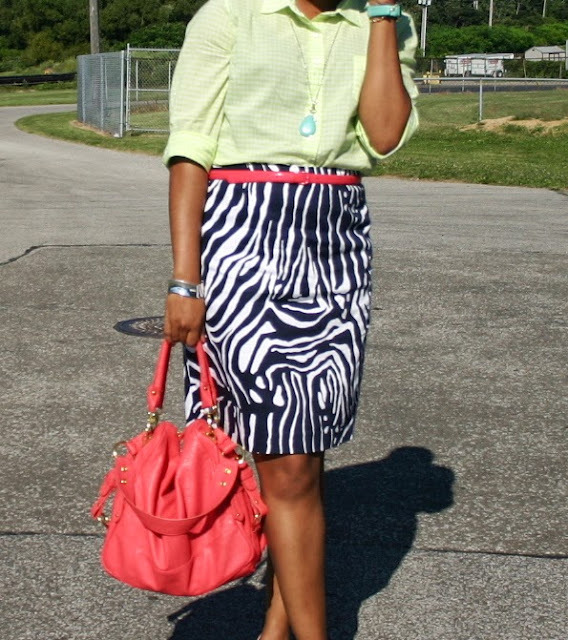 My idea for what to wear today was courtesy of this week's Style Me Friday link up hosted by The Fashionista Next Door. And it's all about the button up shirt, also commonly referred to as the "button down." My initial plans were to work up more of an after hours, chill look, but time constraints forced me into settling for a day-to-day work look. But I still needed a little more inspiration to help me pull together the new neon gingham print blouse I'd purchased (my brain is fried, y'all). And then I happened upon a post from the lovely Beth Dreyer blog. For some reason I was really drawn to the juxtaposition of the gingham against the zebra print so I decided to give it a go! So pairing these pieces together also gave me a chance to do some print mixing. For my outfit I felt the neon color played really well against the navy print. It was a little country chic meets city chic. And although this shirt is geared toward summer, with its softer, lighter weight and vibrant hue, I plan to carry it on into the winter months, using it to turn drab into fab by layering it under charcoal colored pull over sweaters. Which will allow the collar and cuffs to bring a bit of pow to the look. I should be back to my regular posting schedule next week. I hope you lovelies have a wonderful weekend!